With the ability to connect content with the newsroom on a minute-by-minute basis, I have reported from the field, via twitter and email. 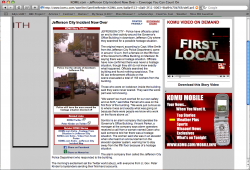 This allows the web editor to continuously post story updates as I receive information. Our audience can experience the story telling process as it happens. The story to the right involved a potential hostage situation. Although it turned out to be a hoax, by tweeting from the scene, and calling in information as I received it, our web editors could keep our audience up-to-date with the story as it progressed throughout the day. Since there is such a focus on web-based content, I strive to turn a newstory from broadcast format to print so web audiences can comprehend it on a deeper level. With each story I produce for television, I write a print version for the web, delivering more information to tell all facets of the story, even if it wasn't in the newscast. In the story to the right, I added additional information, utilized photos, graphs, and a slideshow to enhance the web content. As a web editor, I've been responsible for posting and editing content for online audiences. 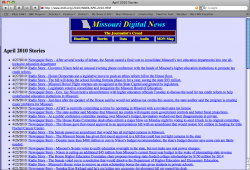 Creating what I like to call, web-extras, gives additional flair to a web story. Flash graphics, still images, slide shows or even links to similar stories, allow viewer-interaction to keep them engaged with a story. 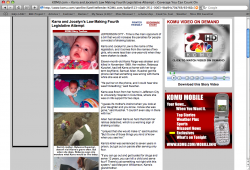 Below is a slide show I created to go along with the story of baby Karra and baby Jocelyn.